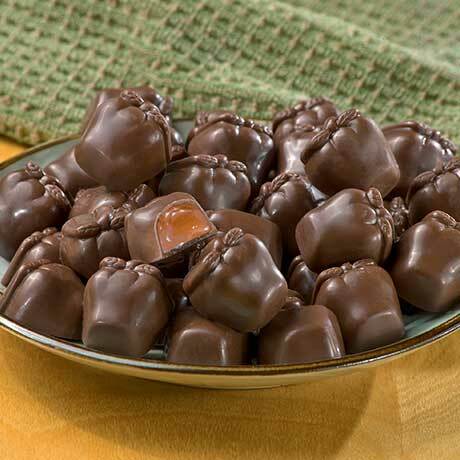 Milk chocolate apples give way to a soft caramel center. 7-ounce box. Please note: Shipping may be delayed until temperatures drop below 80 degrees. Milk chocolate (sugar, cocoa butter, whole milk, chocolate, soy lecithin, vanilla), invert sugar, corn syrup, sweetened condensed milk (milk, sugar, skim milk), sugar, hydrogenated coconut oil, sorbitol, sunflower oil, salt, soy lecithin, potassium sorbate.